I have been using PhotoShop for a number of years, but in the last 12 months as I have been creating custom liveries for Need For Speed – Shift 2 (Link) and Project CARS (Link) I have started to started to make greater use of Paths and Vector Shapes. However, one area that I have always found difficult to master is combining multiple Paths into a single Path. For some reason it just didn’t work they way I expected it to and sometimes the results appeared to be totally random. When I mentioned the challenges that I was having when combining paths a fellow member (Ryno917) on the Project CARS forum he recommended that I check out this tutorial (Link). Unfortunately, this tutorial did not answer all my questions about combining paths. However, it did start me thinking in a new direction that ultimately led to me finally getting my head around how to combine Paths in PhotoShop to get the result that I wanted. 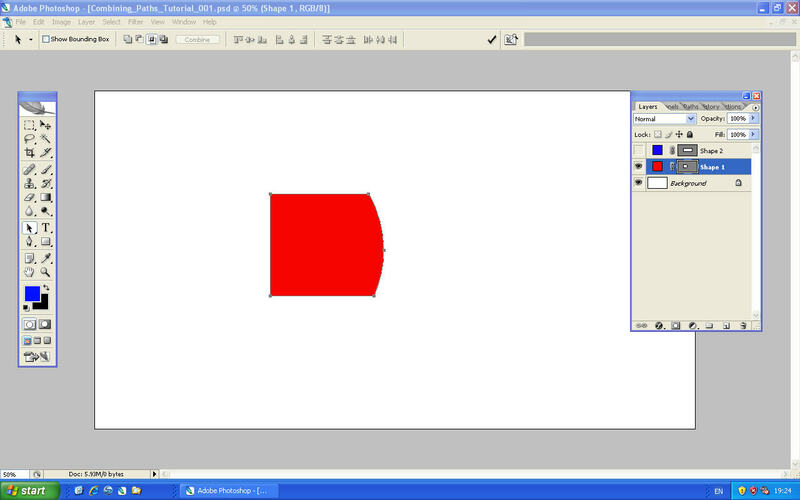 For this tutorial I’m using PhotoShop CS2 on the PC, not the most recent version I know but this tutorial should also work for newer versions of the application and for the Mac. I’m also going to assume that you understand how to create vector shapes and select paths, so that I can focus on the detail of combining paths in PhotoShop. I’m going to start with the basics of joining two Paths together (Union) and creating a new path from the overlapping area between two paths (Intersection). I will then move on to look at how you can create a new Path by removing the over lapping area between two paths (Exclusion). Removing one path from another (Subtraction) is the function that I have experienced the most difficulty with, so I’ll leave that one to the end. You will need to start from this point for each of the 4 exercises in this tutorial, therefore I highly recommend saving this file so you can quickly revert back to this position when you have completed each exercice. 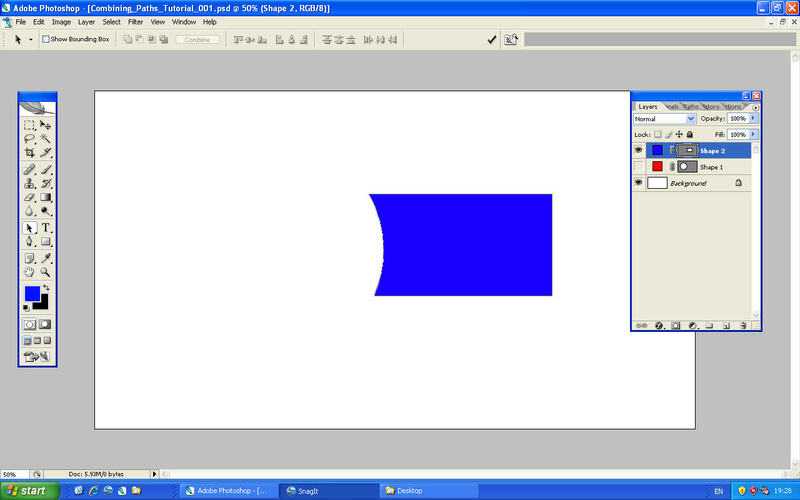 This is the most basic and easily understood of the PhotoShop combine functions for Paths and Shapes. You take two Paths and combine them into a new path that defines the same area that the two paths outlined. You should now have a single shape that defines the same area that the two paths previously outlined. This is another straight forward function to understand. Take two paths that overlap and combining them together to create a new path which only includes the area of overlap. 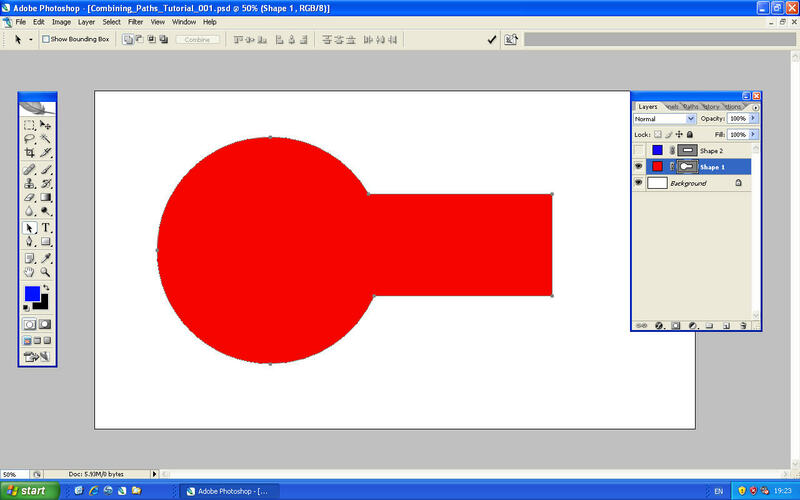 You should now have a single shape that defines the same area that was overlapped by the two paths. Now we are starting to get a bit more complex. Exclusion is effectively the inverse of Intersection. So rather than being left with the area that the two paths overlapped, you are left with the area the two paths defined excluding the area that they over lapped. I’m not sure how often you would use this option, but good to know it is there if you need it. You should now have a single shape that defines the same area that was outlined by the two paths, but excluding the area of overlap between the two shapes. Now we get to the function that has caused me so many issues in understanding how it works. I’ll begin by sharing the key lesson that I learnt from the tutorial (Link) that I was recommended to look at. In the previous three exercise it does not matter if you copy the circular path to the rectangle layer or the rectangle layer to the circle layer, the end result once you combine the paths will be the same. For the Subtraction function this is NOT the case, and you will get a different result depending which layer you copy from and to. In the the previous three exercises it was necessary to select both paths once they were on the same layer before clicking the “Combine” button to create the new path. However, for the Subtraction exercises it is important to make sure that only the path that you have pasted into the layer is selected. In the previous three exercises we have copied the rectangle path from the higher layer to the lower layer containing the circle, so lets see what result that gives when using the Subtraction function. 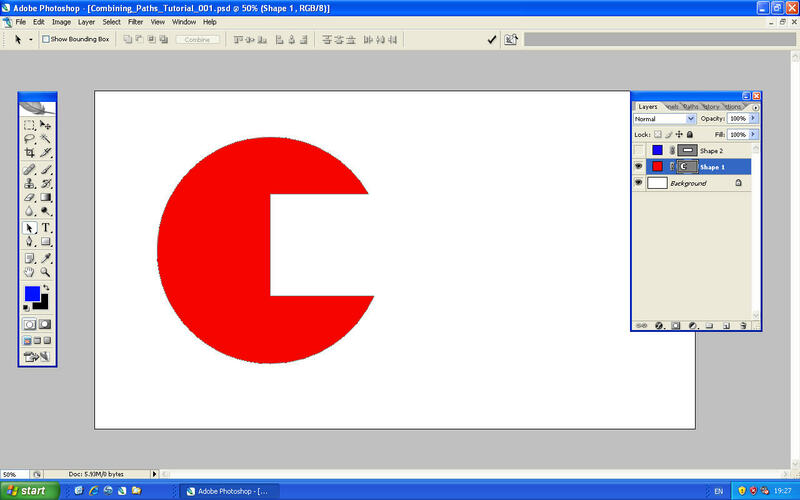 You should now have a single shape that defines the same area outlined by the circle, but with the area outlined by the rectangle subtracted from it, which looks a bit like Pac-Man. But what if that was not the result you are after, and you actually wanted a rectangle with a curve subtracted from the lefthand side? 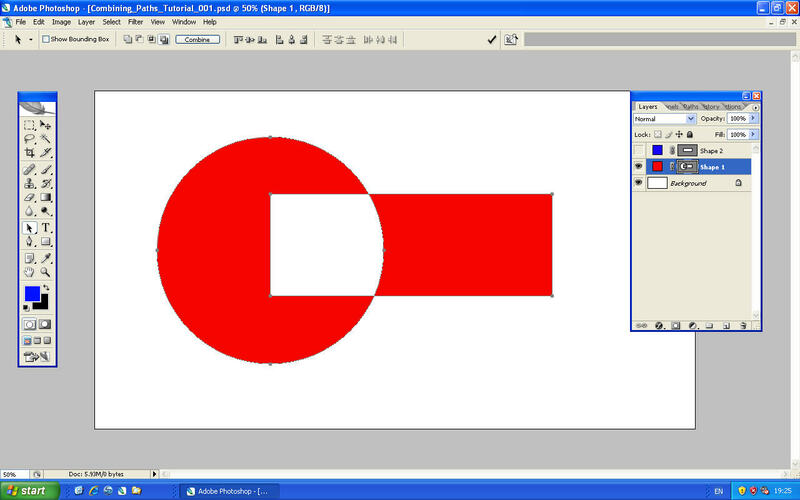 Well lets try copying the circle path form the lower layer to the higher layer containing the rectangle. You should now have a single shape that defines the same area outlined by the rectangle, but with the area outlined by the circle subtracted from it, which looks a bit like a chocolate bar that someone has taken a bite out of. Hope fully this tutorial has explained how to combine paths in PhotoShop to get the end result that you are looking for. Initially it may see a bit confusing (especially the subtract function), but with some practice it soon becomes easy to use and understand. And a final tip, when you have the two paths on the same layer you can preview the final result by clicking the Union, Intersection, Exclusion and Subtraction options before you click the “Combine” and create the new path. 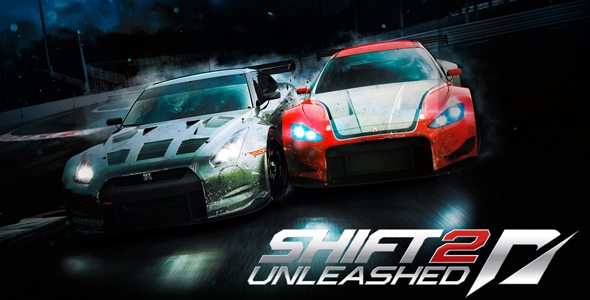 Like the first game in the Shift series, Shift 2 Unleashed was developed for EA Games by Slightly Mad Studios (SMS). However, unlike the majority of the other Need for Speed games, the Shift series focus on circuit based racing rather than illegal street racing mixed with max power style car modification. The big attraction for me was the beautiful graphics, the great selection of real world circuits and the official licenses for the FIA GT3 and GT1 championships. Having recently built a gaming HTPC I decided to purchase the PC version of Shift 2 rather than the PS3 version for two key reasons. Firstly the graphics are significantly better, and as was the case with the first Shift game, there was the possibility of community developed mods to extend and enhance the game, but more of that later. Lets begin with the graphics, and in my opinion Shift 2 is the best looking racing game I have played to date. The car models are highly detailed, and the lighting gives the game a realistic quality that the sterile GT5 cannot get close to. The range of cars available to drive includes all of the GT1 cars and with the exception of Ferrari, all of the GT3 cars as well. In addition to these race cars, there is a good selection of cars available from the Golf GTi through to the new Pagani Huayra, and all of these cars can be race modified if desired. The cars all feature high quality interior views (take note GT5) and multiple pre-defined liveries that you can choose from. Unfortunately the in game editor that is supposed to enable you to create your own custom liveries, in much the same way as the Forza series does on the XBOX, is frankly unusable, as was the case in the original Shift. One of the hyped features of Shift 2 was the helmet camera, which was designed to provide a more immersive driving experience. It is a nice idea and well executed, but the amount of movement as you accelerate and brake becomes tiring after a short period of time, so I much prefer to stick with the standard in car view. Once you turn off the annoying American announcer the sounds are generally very impressive, and each car has distinct engine sound (take note of that again GT5), even if there is too much transmission whine, especially in the road cars. Early in the game where you are racing road cars like the Golf GTi on tight street courses the AI drivers have a tendency to regularly drive into you from behind in the braking areas, which can be very frustrating. I’m not sure if this was a result of the patches or a combination of the class / tracks that I have been racing on more recently, however this issue appears to have gone away. 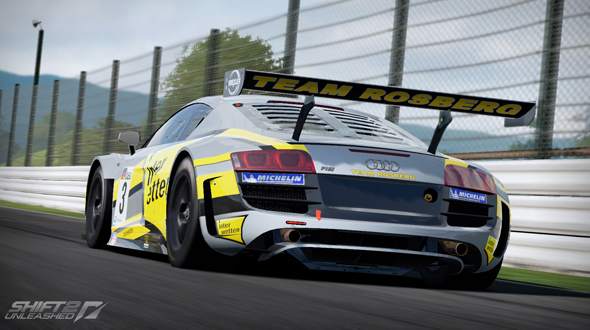 In fact I have driven several close races in the GT3 class against the AI drivers where they have been very clean. I was also impressed to see them moving off line to defend the inside line into the braking zones for hairpin corners. But its not all good new, unfortunately as there are a few fundamental issues with Shift 2, even after the release of two patches for the game in 2011. Firstly, it appears that the game was designed to be played on a console with a joypad, and not a PC with a steering wheel. As a result the handling of the cars is inconsistent at best, and for some like the Lotus Exige the car is almost undriveable. By adjusting the suspension settings in the game some of these handling issues can be reduced, but the game should not have been released with cars that handle so badly with the default setups. The two other main issues are the gravel traps and magnetic attraction to other cars. If you so much as put a wheel wide into a gravel trap the car is unrealistically and violently sucked in, irrespective of the amount of steering lock applied. Similarly if you make contact with another car, the two cars become locked together and there is very little you can do as both cars head towards the nearest barrier. Overall Shift 2 has the feel of a great game that was rushed, not finished or probably both. For example, it was discovered that Shift 2 has 5 hidden cars (Alfa Romeo 8C Spider, Aston Martin DBS Volante, Audi R8 Spyder, Koenigsegg Agera and Pagani Cinque Roadster) already in the game that were intended to be part of a 3rd Down Loadable Content (DLC) pack. Unfortunately, following an announcement by EA Games on 3rd July 2011 that development and support for Shift 2 had come to an end, it looks as though these cars will never be available to drive in the game. However, all is not lost thanks to the enterprising modders out there in the sim racing community. While surfing the NoGripRacing forum I came across the “Unofficial Community Patch” which has dramatically improved my enjoyment of this game. The handling of the cars when using a steering wheel has been significantly improved. Apparently the location of the fuel tank was in some cases up to 2m behind the rear of the car, and as you can imaging this would have a detrimental effect on the cars handling. Similarly the quick sand nature of the gravel traps and magnetic effect of making contact with other cars have both been reduced, but not eliminated. 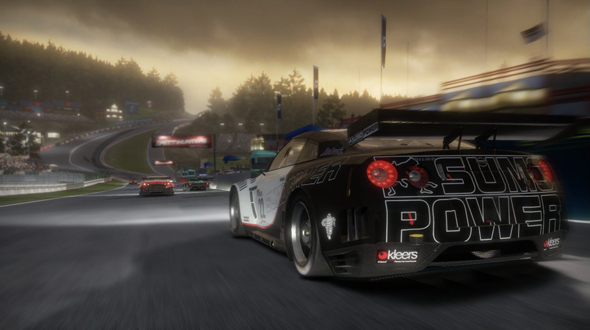 This patch also added several new levels to the career structure that enables the player to unlock the cars that would have been available as part of the 3rd DLC pack. 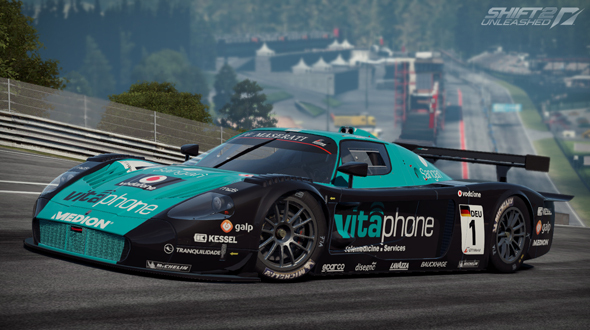 With the PC version of the game it is also possible to create your own custom liveries in PhotoShop and import them into the game, thus circumventing the terrible in game livery editor. Creating a realistic livery takes time and the import process is far from straight forward, however I have successfully created several custom liveries and published a step-by-step guide to help others in creating their own custom liveries on the NoGripRacing forum. So where does that leave Shift 2, well the various community mods have transformed an unfinished game into one that is highly enjoyable and one that has provided some of my best sim racing experiences. So if you have a PC that is powerful enough to run the game with the graphics maxed out, a steering wheel and pedals, and you are happy to install some community mods to improve the game, then Shift 2 comes highly recommended. 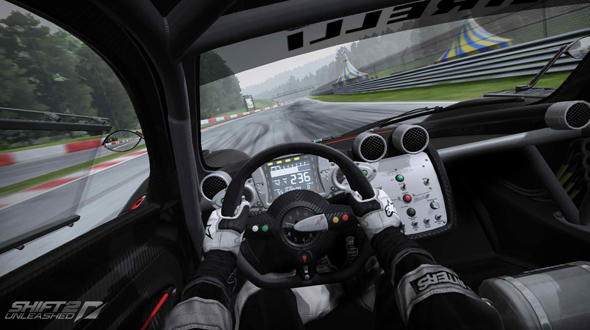 If you would like to see what SMS can do when they are able to create a game that is designed from the ground up to be played on a PC with a steering wheel (and without the interface of a major studio), take a look at projectCARS which is currently in development and is expected to be released in late 2012 or early 2013. I have already invested in this community supported initiative and will share my thoughts on the game as it progressed over the next 12-18 months in future posts.